I just received great news in an email from my friend Cliff in Nebraska. I met Cliff Harris and his friend Herb Swan at an Idaho hunting lodge in June 2010. Cliff’s vision is so poor that he’s legally blind, but he was able to hunt with a good riflescope and help from Herb. Ron and I showed them my adaptive shooting gear, and I commented that Cliff might benefit from a scopecam because it would help a companion coach him while aiming. We stayed in touch, sharing news of our hunts. 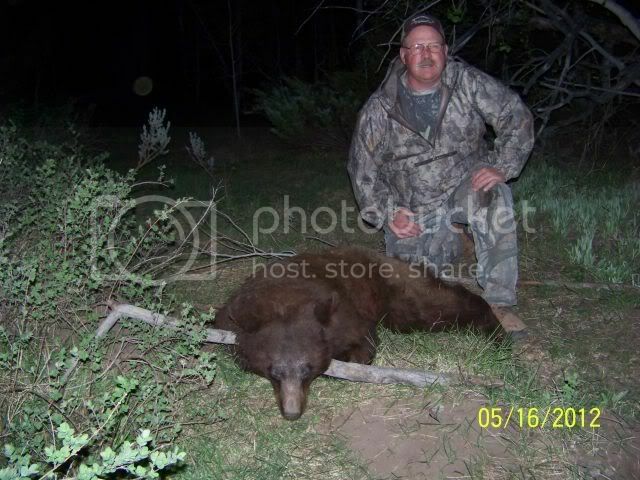 Then Herb emailed me in February: He and Cliff were looking for a scopecam to use on a spring bear hunt, but the Trophy Shot website was no longer available. Where could they find one? A few years ago I had acquired a spare scopecam to keep as a backup; I offered to send it to Cliff. His positive attitude and sense of humor shine through in his description of the hunt, so here it is in Cliff’s own words. Herb and I went on our spring bear hunt in Wyoming. The first day to hunt was Mother's Day. Herb had his bear in about three hours. He bagged a real nice black boar that measured about six feet. Since there was only one guide, whoever wasn't hunting had to wait back at camp. The next day was my turn. Jim, the guide, was hesitant to let me up in a tree stand. It was only 12-15 feet high. I kept telling him that I've fallen farther than that before. But the first night he took me to a ground blind. We didn't see a thing. The second day he reported the baits had been hit at both the ground blind and the same stand that Herb shot his bear, and then he gave in and let me hunt from the tree stand. We didn't see anything but it gave me a chance to get comfortable with the scope cam. On the third night we were back in the same tree stand. We were settled in the stand by 5 p.m. and Jim was snoring by about 5:15. I was using my binoculars trying to see something. This stand had two baits. One was straight out at about 70 yards. I could see it fine. But the other was about 150 degrees to the left at 100 yards. I had a tough time seeing that one. I get the muzzle on the bait in front of us. Jim said the bear was looking right at us. It then took off into the trees to our left. Jim told me to get on the bait to our left. It took a good 5 minutes for the bear to show itself. When it did, Jim helped me get the crosshairs on it and I squeezed the trigger. It ran back into some very thick cover. Jim went after it and after 15 minutes he spooked it out. It ran across a creek. It didn't go very far. It let out its death moans and the hunt was over. My bear is a good looking 5-foot sow. It’s a reddish cinnamon color with dark ears, paws and tail. The biologist who checked it in figured it to be about 8 or 9 years old. For the area we were hunting he said it was an old bear. Now it’s a dead bear. Herb and I took our bears to a taxidermist in Rawlins WY to have rugs made. I'm not sure how my guide dog will like that, but we'll find out in about nine months or so. I do thank you for the scope cam. I think it will allow me to hunt for many more years. As of now, Herb and I don't have anything planned. I'm sure that will change in the near future. I'll let you know what's next. Last edited by Brazilnut; 05-28-2012 at 11:25 AM.